LP0328. 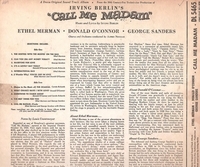 CALL ME MADAM, Original 1953 Original Sound Track Recording, w.Ethel Merman, Donald O’Connor, George Sanders. (10” LP) Decca DL 5465.